Sort of. Way back in 2016, I wrote “Ron Shandler’s Other Book” in which I introduced the concept of the Broad Assessment Balance Sheet (BABS). I decided that BABS needed a more formal, permanent place to live. Not exactly. The BABS Project is a review and expansion of the concepts first presented there. It is a more robust treatment of BABS. She’s been bulked–up, fine-tuned and is now greatly toned. Sounds like she spent the last year at the gym. As a matter of fact, she did. The BABS Project is the story of her journey. It is the place where you can learn about where she came from, how she works and how to get the most out of your relationship with her. It’s nice that you’ve given your concept a human persona but all I really want is a way to win my fantasy leagues. But no, we really don’t get it. We know that baseball cultivates a love affair with statistics. But, those numbers work best in describing what has already happened. Used correctly, they do a terrific job of that. But we take a massive leap of faith in proclaiming our aptitude as soothsayers. Yes, past statistics can be manipulated to project future performance, but within a very wide range of outcomes. Extraordinarily wide. The problem is, for our fantasy leagues, we need far more precision than we can currently achieve. Yet we continue to go into each season with meticulously-crafted rankings lists, player values and targets. Are you saying that all my draft prep is a waste of time? Seriously? It’s not a complete waste of time, but we put far too much effort into the process and far too much credence in the minutia. We still look at a 30-HR performance – or 50 steals, or 200 strikeouts, etc. etc. – and fixate on those numbers as if they hold some religious significance. We are still seduced into making important decisions based on the wild allure of small sample sizes. We still try to ferret out patterns in the stats, even if what we’re looking at is mostly noise. We still look at research results based on aggregate data and draw finite conclusions about individual players. And recency bias? Oh, don’t get me started. As hard as it is to comprehend, there is often not a significant difference between a 3rd round player and an 8th round player, or between a $19 player and a $9 player. And yet we agonize over ADPs and engage in auction bidding wars. BABS looks at the process of building a viable fantasy baseball roster through an unorthodox lens. For over three decades, we’ve taken a bottom-up approach to roster construction, focusing on projecting player performance and then building from there. This book takes a top-down approach, focusing on the structure of the roster itself, and then filling in the pieces. After all, winning is not about nailing projections; it’s about weighing skill versus risk, and balancing assets and liabilities. It doesn’t matter if you think Mike Trout will hit 41 HRs, or 31, or 24. You might be right; you’ll probably be wrong. It matters how his overall profile fits into a well-built roster. On Draft Day, successfully reaching statistical targets provides false comfort; how many post-draft standings projections ever come true? But creating a solid foundation and structure, and then building it out by arranging your assets and liabilities provides a higher-level perspective that allows for better roster management. Back in the 1990s, the greatest advantage you could have was possessing better information. The internet leveled that playing field and left us looking for other competitive edges. Over the past 20 years, we’ve gone through numerous iterations involving statistical modeling, news impact analysis and even game theory, but the goal was always to get better player projections. This is different. That’s why you need BABS. Geez, it sounds like you’re tossing off all the years of research you’ve done in the Baseball Forecaster and on BaseballHQ.com. No, not at all. The Baseball Forecaster is still the bible of fanalytics and probably the most important resource for setting baselines for player performance. 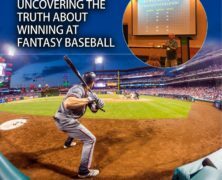 BaseballHQ.com still provides the deepest fantasy-baseball-relevant information anywhere and is the only online source of this caliber that is 100% baseball, 24/7/365. Nice of you to pimp your work but you didn’t really answer my question. Look, all that prior work was built on the foundation of accurate skills assessment. That still applies here. It is still important to be able to evaluate performance in its component parts and understand how that relates to the surface stats that we play our games with. The difference here is that, once we’ve done that evaluation, I’m tired of having to make the leap to a statistical projection. In the Forecaster, we do all that evaluation and then are forced to cull it down to a single line of numbers. I’ve always hated doing that, but we need the data for our draft prep so I keep publishing those numbers. However, like I write in the Consumer Advisory in the front of the book each year, there are far more important things to look at beyond that stat line. So here I get to say, “Sorry, I’m not going to do it.” If you absolutely need to know how many bases Billy Hamilton is going to steal so you can plug it into your fantasy model, feel free to go to another source. You won’t find that number here. But if you’re at least curious about trying a different way, well, that’s why you must be reading this right now. Sorry, but I’m not going to give up my stats. So am I going to get any use out of this book? You don’t need to abandon your stats but you’ll have to be willing to try relying on them a bit less. With BABS, players are not stat-producing machines; in fact, they are also pretty flawed as human life forms. Rather than attempting to figure out what type of numbers they are going to put up, my focus is on describing them in the most accurate non-statistical terms, and then assembling these formless entities into productive rosters. Sounds like you are trying to reinvent how to win at fantasy baseball. That seems overly ambitious to me. I never shy away from a challenge when I believe there is a better way to do something. And I do believe we’ve been doing things wrong for a very long time. For those of us who’ve already read your “Other Book,” how is The BABS Project different? 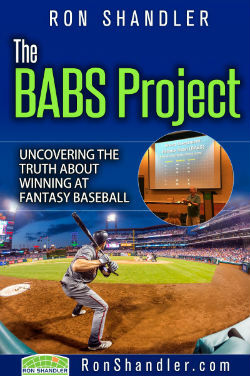 The BABS Project contains all of the conceptual and instructional information that appeared in the “Other Book,” plus several changes and enhancements to BABS. All the additional essays that were posted on RonShandler.com after the “Other Book” was published (such as applications for auction leagues, keeper leagues, in-season, etc.) are included here as well. It’s important to note that The BABS Project is intended to be an “evergreen” reference resource; most of the examples and exhibits are presented in general terms. That means this book does not include any player ratings, rankings or cheat sheets for the current season. All that time-sensitive data, for this year and all future years, will appear online at RonShandler.com. Okay, how do we start? We begin with the decision-making process. How do you decide which players to draft? How do you decide what strategies and tactics to employ? How do you decide when to pull the trigger or pull the plug? Most decisions in life come down to whether to take action and do something, or to avoid something. When we are thinking about drafting a player, or trying a new strategy, or cutting an underperformer, we are trying to consider the potential benefit of making a good decision versus the potential pain of making a bad decision. Research has shown that people are more motivated to minimize losses than maximize gains; we are far more likely to act out of fear of pain than quest for gain. So let’s start by inflicting some pain. Just downloaded the book and took a quick glance over the table of contents and the appendix. My first thought is that page 100 (for me anyway) will be very valuable. Looking forward to the reading and excited to see the database when it is available. We have a tentative schedule in place. St. Louis and Chicago will be the weekend of Feb 25-26 but we have not yet nailed down which city will be Saturday and which will be Sunday. Also, there is a chance that I will not be speaking that weekend as they have me doing the California leg this year. Plans should be nailed down in a few weeks. Will you be in Atlanta this year? Unfortunately, Atlanta is not on the schedule this year. Tentatively, Chicago/St. Louis (Feb 25-26), DC/NY/Boston (Mar 3-5) and LA/SF (Mar 11-12). I will be at all the stops this year. I am a member. Am I supposed to be able to download this for free now? I cannot figure out how to do so. Please help. Click on the CONTROL CENTER link in the MEMBERS ONLY area. The link to the book’s PDF is there. This was confusing for me too. I think I wound up paying the $5 unnecessarily. The dough is no big deal, but it isn’t an ideal user experience. Michael – Use the Contact page to send me the email address under which you placed the orders. We’ll refund the $5. Used BABS last year for my drafts and plan on doing so again this year. For me the hard part was during the season trying to find the best player to pick up when rosters are constantly changing along with the free agent pool and not having a way to do this without manually making every change for each individual league. The BABS ratings will appear online here, beginning in a few weeks. Members can view last year’s draft and final ratings in the MEMBERS ONLY area. “Admittedly, it’s tough for those of us who have the math ingrained (like me!) to wrap our brains around a system that does not use numbers. As the most innumerate fantasy player I know, I can’t thank you enough for this. A thought about relative risk—which you have addressed as a personal preference in your BABS Project book. You note that you prefer not to incur risk with your core players—which I would argue should be elevated into a principle of use, rather than to leave it modestly as your personal preference. I think there is a true interaction between the value of the player (high skill set) and the risk he carries—which extends beyond personal preference. In BABS, the liability profiles can be identical among different players, but the impact of those risks can vary according to the draft position of those players. So it can be argued that the risk associated with a front-line player has greater impact than the same amount of risk for a player whose contributions are less crucial to team composition. You yourself point this out—almost in passing—in your hypothetical draft described in Chapter 10. I think the point you make is of lasting importance. So this year, I will be weighting my risk. I want to minimize it with my front line players, and incur it with my secondary teammates—even if BABS says the two players carry the same risk profile. Excellent post. I agree with you, with one exception. In many leagues, especially in high-stakes competitions, it is often the owner who takes the most high-stakes risks who ends up victorious. But in general, I focus the risk-taking on the players who potentially could yield the most profit. Finding a few $10 and $15 players who return $30 can be easier than taking the $30 risk on a player who could return anywhere from $20 to $40.